If you grew up in the late 1980s or early 1990s and were an avid automotive enthusiast, chances are you fondly remember the great Delta HF Integrale, arguably the last super exciting (from a driver's perspective) Lancia model. And while Lancia has turned a new page in its history, tending to the needs of customers enamored with fashion catwalks instead of rally courses, there are plenty of drivers out there who cherish the original spirit of the Italian brand. 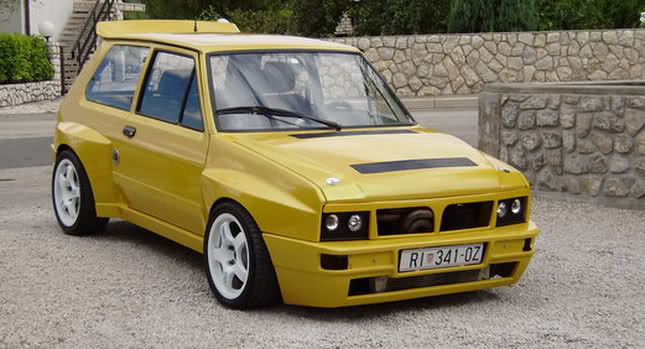 Some, however, have taken their love of Lancia to the extreme turning mundane Yugos, itself a by-product of the Fiat 127, into Integrale replicas.